PITTURA MURALE PER INTERNI TRASPIRANTE, A FINITURA BIANCA OPACA, CARATTERIZZATA DA ECCEZIONALE POTERE RIEMPITIVO. 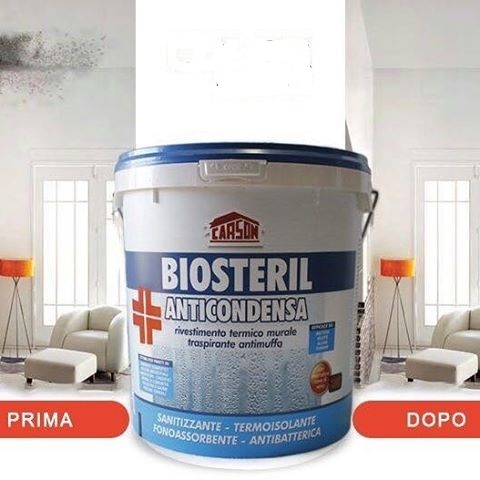 LE PROPRIETA' TERMOISOLANTI E FONOASSORBENTI, GRAZIE ALLA SPECIALE FORMULAZIONE CON MICROSFERE CAVE DI VETRO, RIDUCONO LA DISPERSIONE DI CALORE ATTRAVERSO LE PARETI, IMPEDENDO LA FORMAZIONE DI EFFLORESCENZE DI MUFFA, ALGHE E FUNGHI. IDEALE IN TUTTI GLI AMBIENTI INTERNI DOVE C'E' PRESENZA DI UMIDITA' COME: CUCINE INDUSTRIALI, LABORATORI, CASEIFICI, MENSE. L'ALTA OPACITA'(gloss2,8) UNIFORMA LA FINITURA E NE CONSENTE LA FACILE LAVORABILITA' ED IL RITOCCO.